Today’s landscape designers can’t seem to get enough of the slipper plant, Euphorbia lomelii (formerly known as Pedilanthus macrocarpus). What used to be found only in gardens of dedicated plant enthusiasts is now commonplace and can even be seen in mass plantings in commercial landscapes. But while gardeners and designers have fallen in love with this unusual plant, it remains a rare subject for botanical artists. Drake’s career as a botanical illustrator was notable but lasted only sixteen years. After studying in Paris, she was hired by the famous orchidologist John Lindley as governess and assistant. 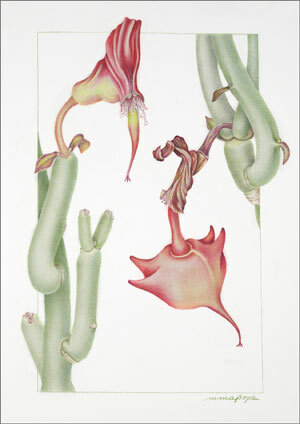 Lindley, an accomplished artist himself, trained Drake to draw from both living and pressed botanical specimens, and she quickly developed considerable skill. She illustrated Lindley’s textbook Ladies’ Botany , and many of her works appeared in the prominent periodical The Botanical Register . Orchids became her specialty, and the most significant paintings can be seen in James Bateman’s Orchidaceae of Mexico and Guatemala and Lindley’s Sertum Orchidaceum . Drakaea, the genus of “hammer orchids” of Australia, was named by Lindley in recognition of Drake’s artistry. In a very short career “Miss Drake” created over 1,300 drawings and paintings before leaving Lindley’s employ in 1847 to care for relatives. She married in 1852 and died five years later at age 54. Drake did not receive the recognition that came to so many English botanical artists of the time. Her orchid paintings for Bateman’s Orchidaceae are considered to be extraordinary, yet she remained relatively unknown, while her co-illustrator for the work, Augusta Innes Withers, was appointed Flower Painter to the Queen. Shown here is Drake’s finely detailed illustration of the slipper plant. 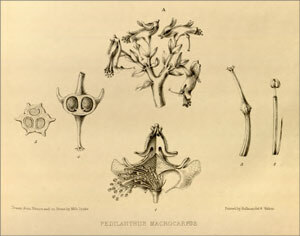 The dominant image is a cutaway of the involucre to reveal the many male flowers, and to the right of that are enlargements of male and female flowers. At the top of the drawing is the habit of a flowering stem, and to the left are sectional views of a mature fruit. This appeared in the September 2014 issue of The Desert Breeze, the monthly newsletter of the Tucson Cactus and Succulent Society.